Olivia Manning never made it big. A workhorse of a writer she had 22 titles under her belt when she died in 1980. While she made a living as a writer, somehow, both critical and popular success eluded her. Now, most of her work is out of print. That she remains in print at all is due in large part to the television adaptation of her Balkan and Levant trilogies called Fortunes of War. Those six books make up one of the greatest epic stories of the 20th century. Ms. Manning spent World War II with her husband, both civilians, first in Eastern Europe and then in Egypt and Palestine. Her stay in Jerusalem provides the impetus for her novel School for Love. 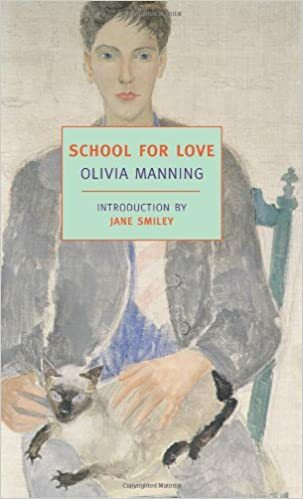 Of course one should avoid looking for signs of the author in the novel, but Ms. Manning was well known for inserting the people she knew into her books, sometimes as a form of revenge, so it’s difficult to avoid falling into the authorial trap. Consider the profound events of Ms. Manning’s time in Jerusalem. During those years, she became pregnant. Tragically, her child died in utero, but because of the laws and customs of the time she was forced to carry it until it reached full term some two months later. It’s easy to see this experience working its way into the plot of School Of Love. Motherless children and childless women abound. School of Love is about young Felix, a teenager, on his own after the death of his mother. Felix finds himself in the pension of a distant relation’s sister-in-law, Miss Bohun. Miss Bohun is an eccentric character, an Englishwoman on her own in Jerusalem. Her primary interest in Felix is the money the British government will pay her for taking him in but she puts on a great show of genuine feeling. Felix is enchanted with her, at first. Alone in the world, he adopts Miss Bohun as a surrogate mother figure and adopts her cat Faro as his one friend. The novel is set in the closing days of World War II, a time when British nationals abroad as well as refugees from all parts of Europe were finally getting an opportunity to return home. Many had been away for years, some of them simply caught unaware by the war. Jerusalem was a place full of people waiting their turn to leave. It’s much like the opening scenes of Casablanca. As Felix begins to grow aware of just how miserly Miss Bohun really is, a new guest arrives– Mrs. Ellis. Mrs. Ellis is much younger than Miss Bohun. She is also both newly widowed and pregnant. She does not settle in for dinners and evenings with Miss Bohun. Instead she goes out nightly to cafes where she meets with Jewish and Palestinian intellectuals. She takes Felix along, and he begins to fall in love with her a bit, though he clearly also sees her as a more suitable mother figure than Miss Bohun. It’s an odd love triangle. Miss Bohun wants affection from both Felix and Miss Ellis. Felix, who is moving on from Miss Bohun, seeks motherly affection from Miss Ellis while at the same time desires something more. He is 15, just at the stage for a full Oedipal complication. Miss Ellis is simply marking time with both. She enjoys Felix’s company, but wants nothing more than that. He knows she will forget him two days after he is gone. School for Love shines a light on wartime experience that we don’t often see. What happens to the civilians who are left stranded by events? How do they find a way to get by, to get shelter, to get employment? What toll does years of waiting for a chance to return take on their lives? What happens to a boy who is forced to grow to manhood under these conditions? One could argue that not much happens in Olivia Manning’s book. While I think this is largely true, I think it produces two worthy results. One, it allows Ms. Manning’s characters to get under the reader’s skin. It’s been years since I last read the Balkan or the Levant books, but I still feel like Harriet and Guy Pringle are old friends, people I haven’t heard from in a while but should probably send a Christmas card to anyway. Two, in the end the readers see that things were happening all along, under the surface perhaps, but happening just the same. When events finally do reach a climax, it is one to remember. By the end of School for Love it’s clear that neither woman wants much to do with young Felix. He sees that even Faro, his cat, just keeps him company because he is the one feeding her. Felix discovers that matters in the end is not who loves you, but whom you love. In the four plus years since I first ran this review on my old blog, Ready When You Are, C.B., I have not read anything else by Olivia Manning. I’m not sure I have anything else–I’ve read her major work. But each of the seven books by her that I have read, have certainly stayed with me. Her characters have worked their way under my skin and stayed there all along. We’ll have to get together again sometime, for a re-read. I’ve only read the two trilogies, but do think she is sadly underrated as a writer. I’d never heard of her before, it’s a shame how great writers can just fall under the radar. Previous Previous post: The TBR Triple Dog Dare Comes to Its Final Close…So How Did You Do?